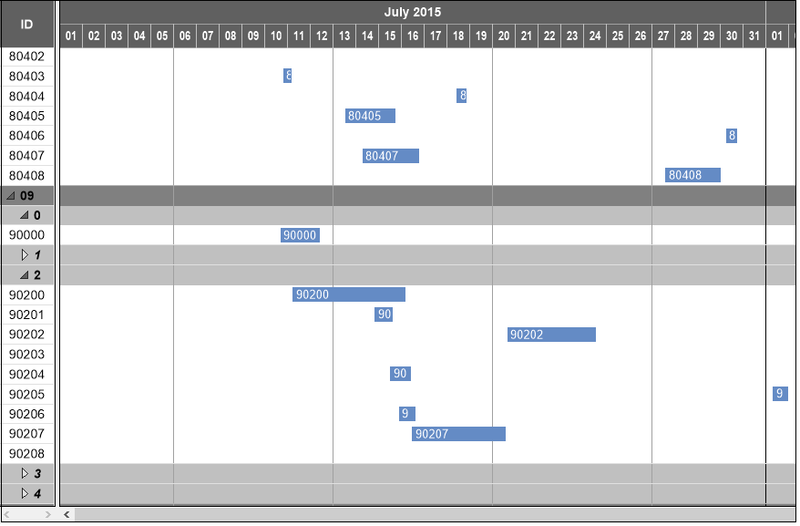 Multi-level groups are used in many Gantt charts. When, in such a chart, a node is to be dragged from one group to another one with the source group being quite far away from the target group, the interaction sometimes could be somewhat inconvenient especially within large data sets. VARCHART XGantt now offers a new functionality for automatically expanding and/or collapsing groups for easy and comfortable vertical movement of nodes to ease 'maneuvering' within big data. This expanding and collapsing of hierarchial structured groups can be individually combined - a short video illustrates three alternative ways of how to significantly simplify vertical interactions in Gantt applications with multi-level groups. The following video shows three examples of different collapsing and expanding behaviors of target groups and subgroups in a Gantt chart. Target group expands and afterwards collapses again, when the node is moved further. All groups collapse automatically when the mouse starts moving. Moreover, target groups and subgroups collapse when a node is moved there or further without MouseUp. Especially the last example illustrates how by the automated process of expanding and collapsing not only the planner’s orientation during the vertical movement of nodes significantly improves but also how the moving of nodes will be accelerated. VARCHART XGantt now comes with yet another function providing more user-friendliness in Gantt charts. Learn how to display context-relevant information while moving a node horizontally. Want to test this function? Get your free download of VARCHART XGantt ActiveX/.NET edition here. For over 25 years we have been developing Gantt controls and consulting companies on visualizing schedule-related data. We know that to really support the planning each Gantt application has to be tailored to the respective planning requirements. Is there a special visualization problem you have no solution for yet? These are the challenges we are looking forward to! Talk to our experts and let them make you free suggestions.